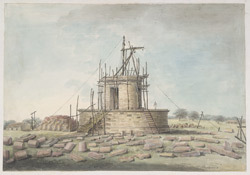 Watercolour of the unfinished Marquis Cornwallis monument at Ghazipur from 'Views by Seeta Ram from Patna to Benares Vol. II' produced for Lord Moira, afterwards the Marquess of Hastings, by Sita Ram between 1814-15. Marquess of Hastings, the Governor-General of Bengal and the Commander-in-Chief (r. 1813-23), was accompanied by artist Sita Ram (flourished c.1810-22) to illustrate his journey from Calcutta to Delhi between 1814-15. Ghazipur, located east of Varanasi on the banks of the Ganges river, is the site where Marquis Cornwallis (1738-1805) died on 5 October 1805. Marquis Cornwallis was the Governor-General and the Commander-in-Chief (r. 1786-93, 1805) responsible for the campaign against Tipu Sultan during the Third Mysore War (1790-92). Inscribed below: "Tomb of the Marquiss Cornwallis in an unfinished state."